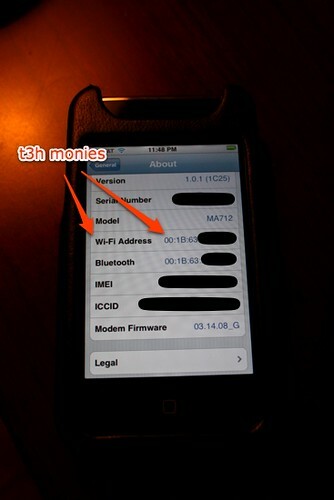 This entry was posted in diy, hacks, Uncategorized and tagged apple, diy, hack. Bookmark the permalink. I ping the bluetooth adapter using the bluetooth MAC address in MisterHouse. It only works about in a 30ft radius around my server PC though. Just a thought. Pretty nice way of thinking. But you’re right, sometimes when “sleeping”, iPhone just stop responding to the Wifi network, although is still connected. I don’t know if you already solved it, as this post is dated from 2007, but anyway could be a good source to others. I had the same goal: cheap, hidden and effective presence recognition. – Script is connecting via HTTP, every 15 seconds, to router’s admin page at “http://$RouterIP/Status_Wireless.asp”, retrieving the page where, in the middle of HTML code you have a function which is drawing a table with connected wireless devices, showing their MAC addresses! – This script is parsing the MAC addresses and checking if my phone’s MAC is in the middle. Doing this, I was able to detect when my phone is connected to the router, without pinging it.